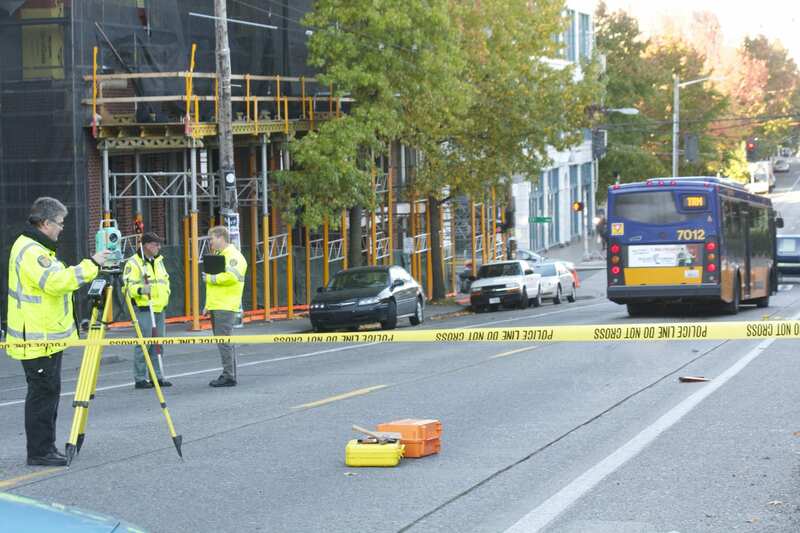 The man who was struck by a Metro bus Monday morning at 12th and Pine has been identified as Peter Cooper. UPDATE: CHS has learned that Cooper was an Irish citizen visiting from his home in Dublin, Ireland. According to John Keane, the Honorary Consul of Ireland in Seattle, Cooper had a brother living in Vancouver, B.C. and the two had come to visit Seattle together. Keane said Cooper’s family has arrived from Ireland to retrieve the man’s body. “It’s tragic … The family was pretty shaken up about it,” he said. While police continue to investigate the cause of death, one witness tells CHS Cooper was already lying in the street before the bus collision occured. Toby Francisco, manager at Mode of Fitness, told CHS he was walking to work down Pine when he spotted Cooper. Francisco said he first saw the body one block away. Initially Francisco said he thought it was a pile of clothes, but as he got closer he could see a pair of legs. Just then Francisco said the Metro bus drove past him and ran over Cooper without braking. “I just want to make sure that the bus driver knows they didn’t mow someone down crossing the street, they were lying there,” he said. Francisco said he immediately ran over to the police station. Due to the slope of the Hill, Francisco said he couldn’t see Cooper’s face. However, Francisco said he would have noticed someone collapsing down the street, leading him to believe that Cooper was lying there for at least a few minutes. The cause of death in the early morning collision is still under investigation, according to the King County Medical Examiner’s Office. Police say the circumstances that led to Cooper’s being hit were not yet known. According to Metro there is no indication that the bus driver was impaired at the time of the collision. The driver was hired in 2010. Despite the multitude of routes and busy schedules, collisions involving Metro coaches and pedestrians in Seattle are relatively rare. The headline on this post has been updated to reflect new information gathered in the course of reporting.